It’s a very snowy day, so I relaxed indoors and worked on her all morning and afternoon. 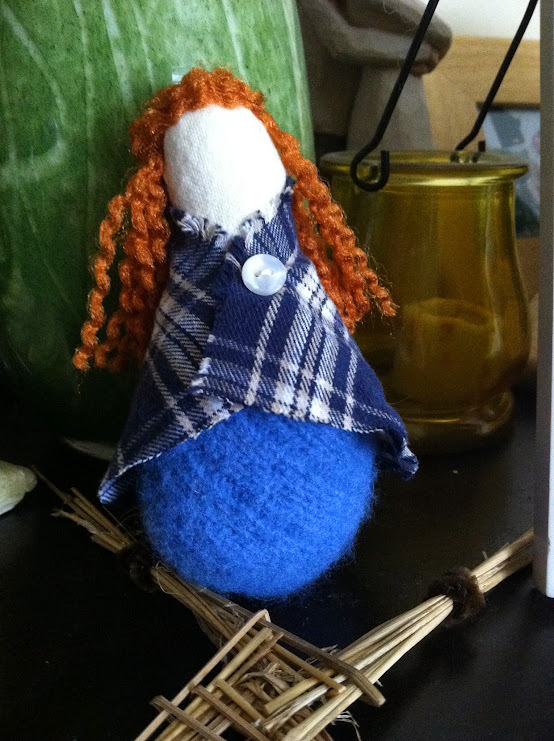 I made her for my daughter so she can decorate her little altar for Imbolc. An experimental quilt and applique piece I made for a friend and grovie, April, while she was going through a difficult time. She had lost access to her altars, and I made this to represent the Three Hallows until she regained access. Craft and Photo by Grey Catsidhe, 2015. I sometimes fret that I’m not as prolific as I used to be. My Druid studies have slowed down, for sure, but my crafting has as well! I often lament how I don’t get to flex my artisan muscles the way I used to now that I’m so often occupied with a little one. 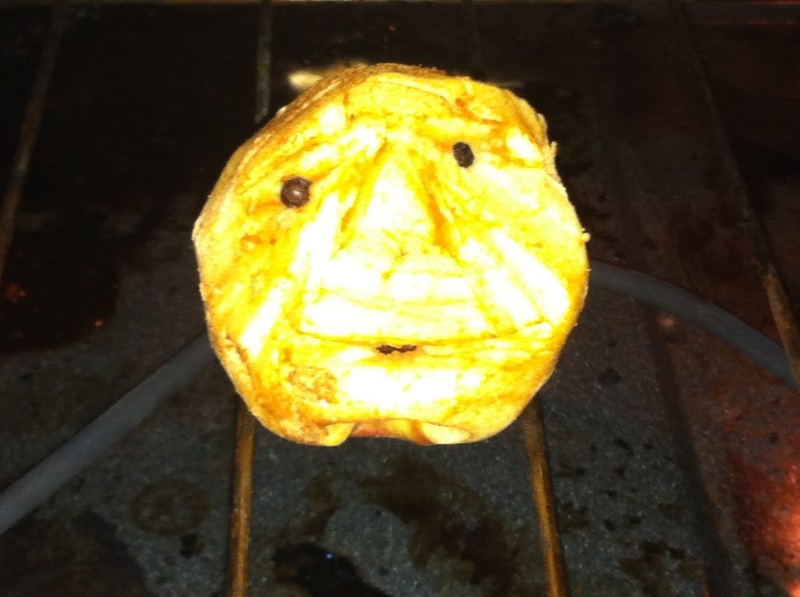 I used to sell my one of a kind art dolls at local shows. I never made a ton of money, but it was enough to keep up with my hobby. The positive feedback from customers really raised my spirits and kept me going, pushing me to work harder at expressing my vision of the Three Kindreds. I recently vented about just that, more or less, to another talented mama. When I got home, after having dinner, I got to work on a going-away gift for a grovie. It was a simple craft, one that would not take days to complete. Most of my work is like that these days, with the exception of the quilt I made for the recent baby saining. I realized that most of my work these days become gifts to family members, ritual objects for myself or my protogrove, or gifts for grovies – my spiritual family. The later is just another way that I give of myself to uplift my community. 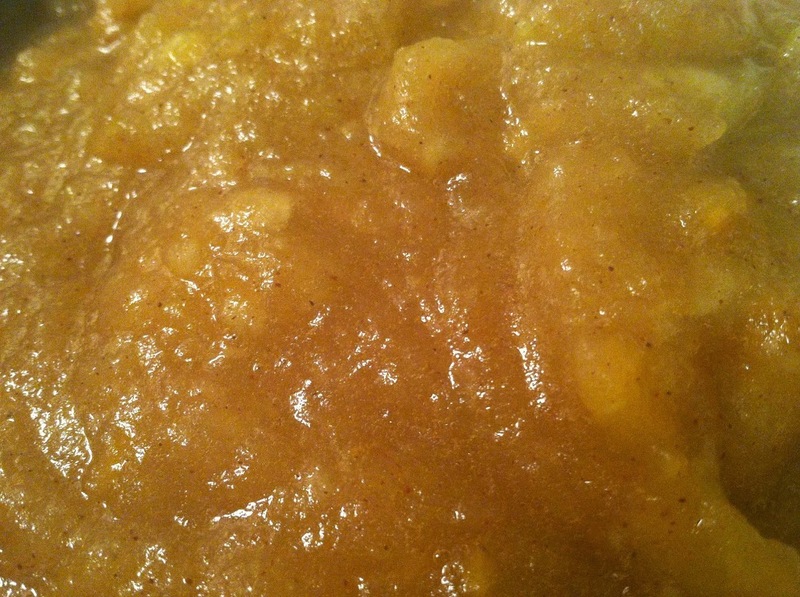 My grovies give so much of themselves to help our protogrove flourish – I love to give back to them. Until I started to think about this topic, I didn’t realize how much effort I put into perfecting my crafts to benefit my spiritual family. Here are some of the recent pieces I’ve made for my tribe. A needlepoint experiment that came out very well! I made this for Tan to remind her that she has the strength of a battle Goddess! Photo and craft by Grey Catsidhe, 2016. My latest needlepoint – a gift for a grovie moving away after he retires from the army. That’s honestly the hardest part of having a Pagan group near a military base… Jacob will be missed! I included a very meaningful quote from one of our favorite chants. 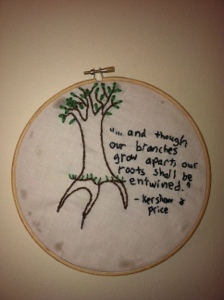 I’m happy with the needlework but I think I could have done a better job gluing it into the frame. I hope he doesn’t mind! Photo and craft by Grey Catsidhe, 2015. Although I haven’t had a chance to make the more complex dolls I used to sell at craft shows, I continue to make smaller, simpler versions for altars or children. I made this girl gnome as a baby shower gift for Cassandra’s little one. Very simple, mostly because she needed to be free of choking hazards, but also very satisfying! Photo and craft by Grey Catsidhe, 2015. Small Brighid Doll by Grey Catsidhe, 2015. 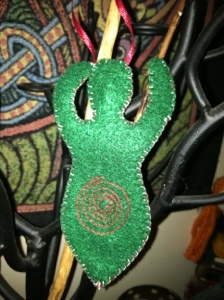 Although I don’t have much time to craft these days, I gleefully signed up for the ADF Artisan Guild Imbolc exchange. The group decided that everyone should make something small, and we decided on the amount of time it should take and the general cost. I was excited enough to participate and do a little sewing, but was absolutely over the moon when I saw that my partner was my dear friend, R! She and I got back to my Utica days, when I was first exploring Paganism. We bonded over an interest in ADF, and she encouraged me to make the drive to Muin Mound in Syracuse. Life took us to different corners of NY, and we don’t get to see each other as often as we used to, but we still bond over our shared interests and meet up whenever we can. R indicated that, despite her Norse hearth culture, she has an interest in Brighid. I decided to make her a small Brighid doll, since the exchange was for Imbolc. I repurposed a blue wool sweater by felting it, and used a little for Brighid’s body. Folk art inspired me to leave the face blank. I usually love painting faces on my dolls, but I really think my decision works for this small doll. It gives her a very solemn look, and the individual regarding the doll will inherently known how they feel she should look. 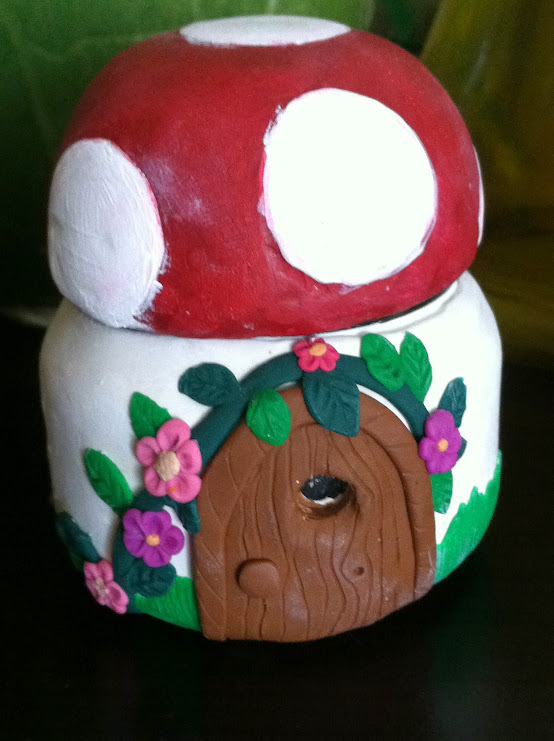 In exchange, R surprised me with this adorable fairy cottage made with polymer clay and a repurposed jar. I love all the whimsical details – right down to the woodgrain on the door! There are even little windows on each side, and Bee loves to peer in. It has be excited for spring with all the pink flowers! Funnily enough, we actually were able to meet up a couple weeks after receiving our gifts. Her girlfriend happened to have a hockey tournament in the area, so we met for lunch. It felt wonderful to reconnect. Hoping to do more of that come the warmer weather! Colorful legs for colorful fairies. Photo by Grey Catsidhe, 2014. Spring Equinox gnomes! Photo by Grey Catsidhe, 2014. With spring right right around the corner, I thought it was time to make Bee another gnome! 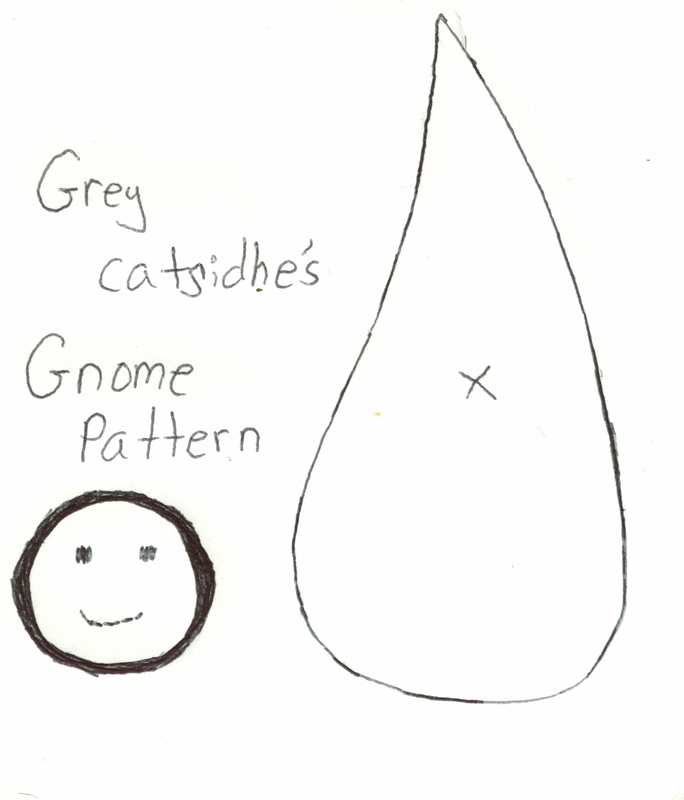 I decided to make a tutorial so you could make your own gnomes for the little ones in your life. 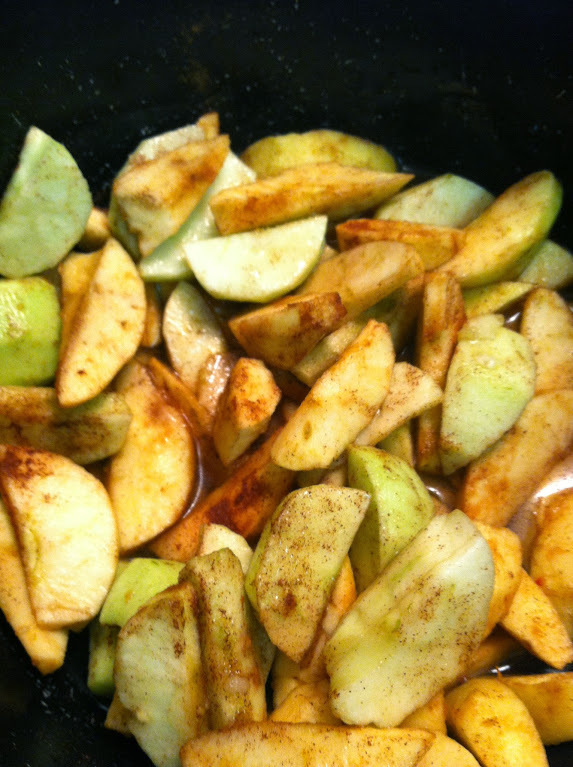 Follow along or get creative and follow your own whimsy! Materials for the gnomes. I use wool roving to stuff my baby toys. You can also find wool felt. Photo by Grey Catsidhe, 2014. The pattern may be enlarged, and should be for a baby. I make mine so that they are small but not a choking hazard. 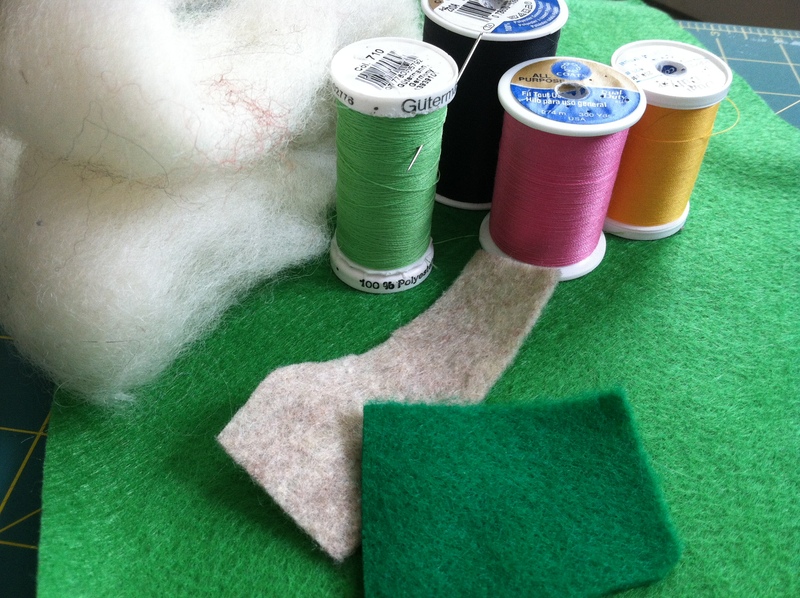 Using the pattern, cut out the shapes in your felt. You’ll want to cut out one face and two bodies. At this point, I find it best to stitch on the face and add any desired details to one side of the body. You can be as simple or complex as you wish. 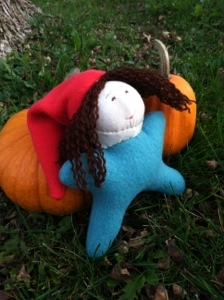 I decided to make this gnome very girlish and even gave her some hair. Stitching on the face to one side first. Photo by Grey Catsidhe, 2014. Starting at the base, stitch from bottom, to the top, and back to the bottom using the blanket stitch. 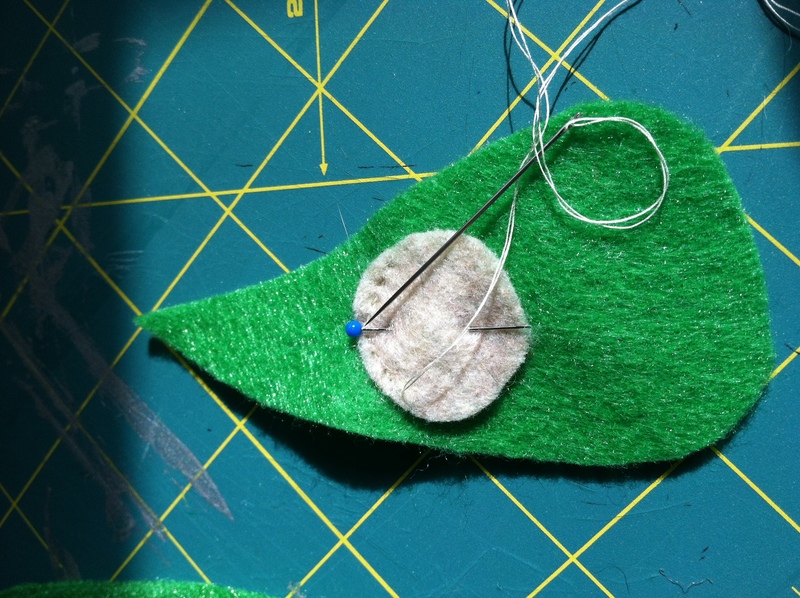 Leave the bottom opened so that you can stuff the batting in before completing the blanket stitch all the way around. As a finishing touch, I added a little leaf to the top of the gnome’s hat. I think it makes the Spring gnome look like a little seedling. Make sure you stitch that leaf very secure! As with all baby toys, inspect your gnomes frequently to make sure nothing is coming apart. My baby loves to gums her gnomes so they can get a bit worn looking. They are very easy to clean with some soap and water. Air dry, preferably in the sun. Have fun making gnomes for wee ones or your own altars! Please share any that you make! I’d love to see. My time is limited and, as a result, I haven’t felt pulled to make the very detailed, large dolls I made prior to pregnancy. Those will come again, but I’ve recently found myself returning to my roots and making dolls with very simple shapes. Some may view that as backwards, but something Phillip Carr-Gomm said in the latest Druidcast really spoke to me. He compared the movement of people back to religions inspired by very ancient myths to salmon returning to their spawning ground and taking part in a cycle rebirth. Not only did it make sense to me in regards to Druidism’s place in the modern world, but it dawned on me that I was experiencing the same thing in my art. Motherhood has transformed my life in ways that I’m only just beginning to understand. It is impacting my art. Everything has to be reborn in this new phase of my life. 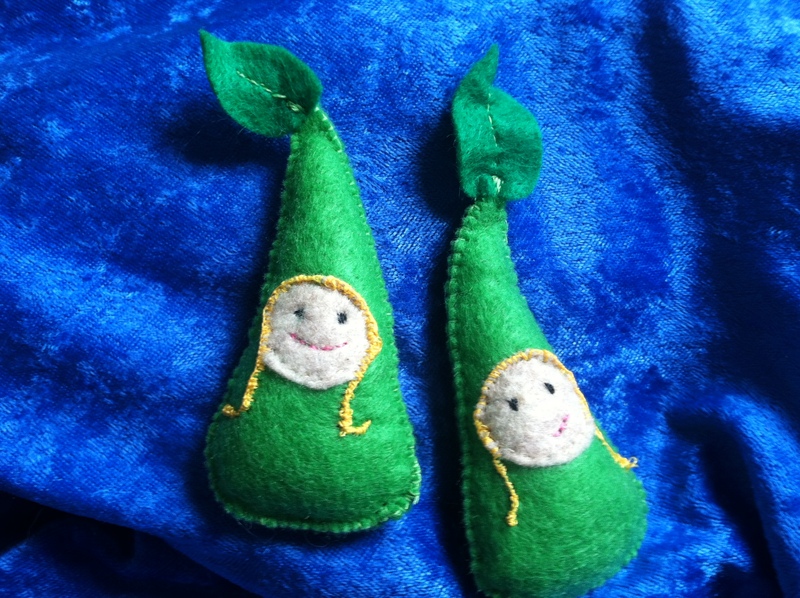 You may have seen the Waldorf-inspired gnomes I’ve been making for my daughter. 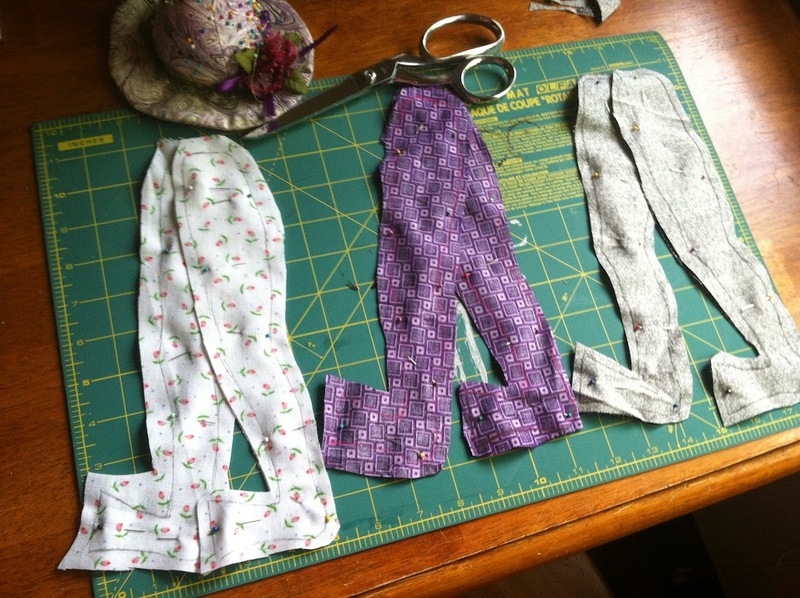 They are akin to my early exploration of doll making. Limbs are very complicated and so I’m not bothering with them so much right now. Recently I’ve been wanting to spend less time on constructing the form and more on adding soul. I decided to make a new Brighid doll for my altar. I’ve said this many times, but I’m a proponent of using your talents to make your own ritual tools. For me, the desire to create representations of deities for my altars is what brought me to doll making in the first place. I retired my original Brighid doll. She was very top-heavy and required a metal and wooden stand. With baby just months away from walking, it seemed like a safety hazard. Brighid has a new home upon my altar and in a form that matches my evolving understanding of her. 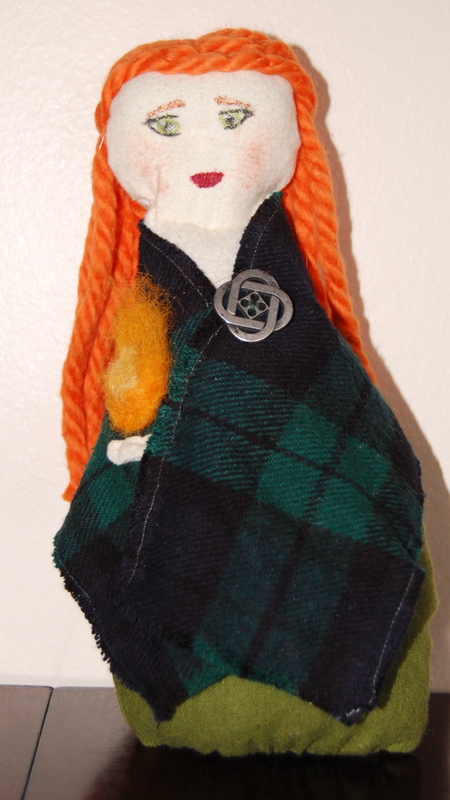 She is more voluptuous, draped in a tartan cloak “pined” with a Celtic knot button to represent her smithcraft and art in general. 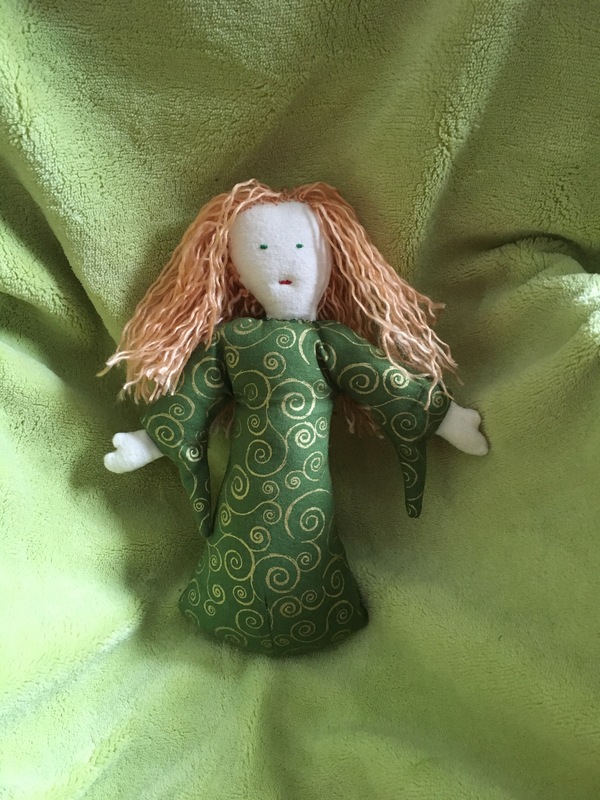 Although I did not make limbs in the usual sense, her hand peeks out from her cloak to magically hold her sacred flame, something I needle felted using dyed sheep wool (also very appropriate for this Goddess). A Brighid doll made and photographed by Grey Catsidhe, 2014. I’m rather happy with how she turned out. As I worked on this Brighid doll, the Goddess sent her inspiration to me and I’ve already started to dream up another doll to represent another Goddess I’ve been working with. In the meantime, I’m planning to ritually consecrate this doll in Brighid’s name to create a “home away from home” for her, thus facilitating communication.